DURHAM - Duke RB Shaquille Powell led two second-half scoring drives for the Blue Devils in their 20-13 victory over Virginia. Powell, who missed last week with a leg injury, returned to finish with 6.2 yards per carry against a highly-touted Virginia front seven. He received a standing ovation in the post-game locker room from his teammates for his efforts in the midst of his younger brother's battle with a Wilms' tumor. 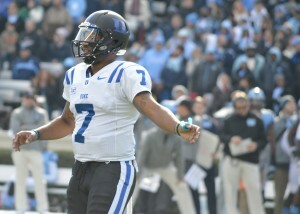 Senior quarterback Anthony Boone led Duke to yet another victory, moving to 16-1 as a starter in regular season games, moving him to second on the Blue Devils' all-time list. He finished the day 22-37 for 176 yards and 1 toucdown, and perhaps most importantly, led the Blue Devils to no turnovers on the afternoon. 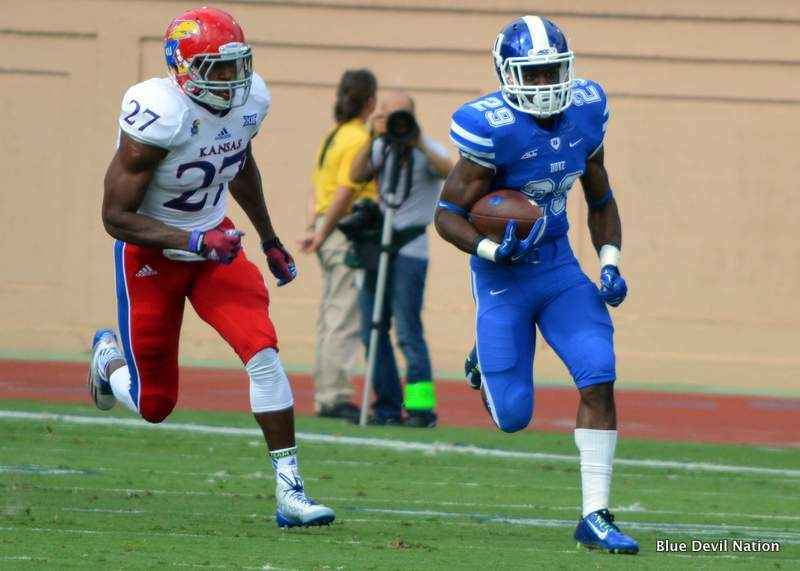 Senior WR Jamison Crowder once again led the Blue Devil receiving corps with 88 yards on 8 catches. He has had at least 2 catches in 35 straight games. He joined Conner Vernon and Clarkston Hines today in the 3,000 yard receiver club at Duke. 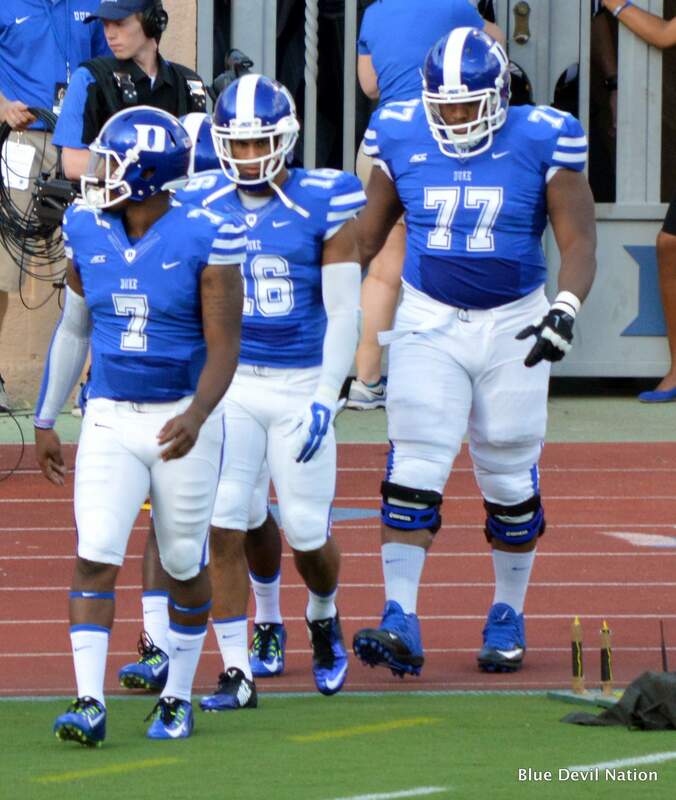 The game ball today probably is split between the aforementioned Powell and the Blue Devil offensive line. Entering today's game, Virginia was among the top defenses in the country, forcing 19 turnovers, 23 sacks, and 43 tackles for loss. On Saturday, they finished without a single turnover, sack, or tackle for loss. Duke averaged 5.2 yards on the ground, nearly twice the season average of Virginia's opponents entering today. Senior OL Takoby Cofield discussed the big victory and bowl eligibility. Duke and Kansas finish out a home-and-home series on Saturday at Wallace Wade Stadium in Durham. The two teams last met in 2009 in Lawrence, with the Jayhawks dominating the Blue Devils, 44-16. Much has changed for the two perenial basketball powers since that last meeting, with the Blue Devils coming off an ACC Coastal Division Championship, while Kansas looks to rebuild under Charlie Weis after totaling just 4 wins in his first two seasons. The Blue Devils are 20 point favorites in this game, against a Big 12 opponent. I'll give you a moment to let that sink in. Over the past two seasons, Duke has seemingly learned how to win football games, while Kansas has found ways to lose. Anthony Boone and the Blue Devil offense should be salivating at film of a Kansas defense that allowed 421 total yards to SE Missouri State in week 2. 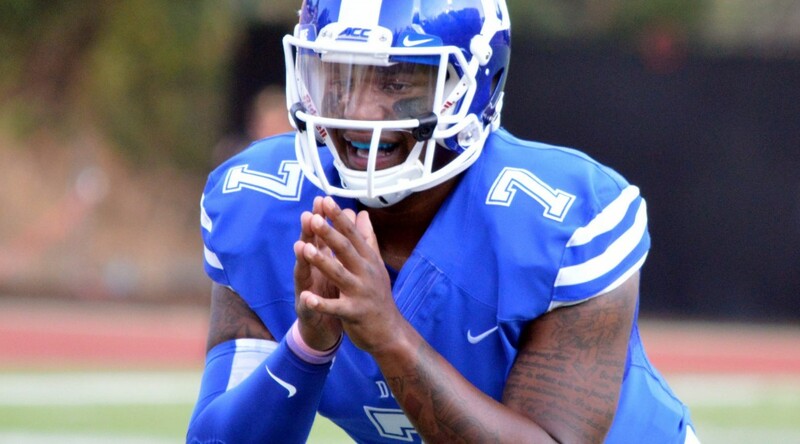 Under new OC Scottie Montgomery, Duke is looking to spread the ball around in their offense, and expect the Blue Devils to continue that trend. Issac Blakeney, already with 3 TDs on the young season, is sure to draw the attention of the Jayhawks' secondary, who will struggle to match up with his size and the speed of Jamison Crowder, lining up opposite him. His wound continues to take care of the ball, expect another big day for the Blue Devil receivers. Defensively, it all comes down to containing the elusive Montell Cozart under center. The Jayhawks' sophomore signal caller is able to make plays with both his arm and his feet, and the Duke defensive front will need to be disciplined in its pass rush. Kansas features a veteran offensive line that averages over 300 pounds; Jordan DeWalt-Ondijo and company will need to continue to find ways to cause disruption in the backfield. Cozart is aided by a veteran receiving corps led by seniors Tony Pierson and Nick Harwell, each of whom found the red zone in the Jayhawks' opener. Offensively, Kansas will present the biggest challenge to Duke's young secondary in the first month of the season. De'Andre Mann and Corey Avery pace the Jayhawks on the ground, and an early Blue Devil lead will help to neutralize their effectiveness. Kansas is a team that can certainly upset the blue Devils should they find a way to put together a complete 60 minute game. In their season opening win, they jumped out to a 24-0 lead behind a balanced offensive attack and opportunistic defense. The Jayhawks forced three interceptions and held the Redhawks to 5/16 on third down. As Duke demonstrated a week ago at Troy, a balanced, up tempo offense can pose a significant challenge. Though only a sophomore, Cozart has the talent to be a dynamic playmaker and has the offensive weapons to put up points quickly. Expect Weis to have a solid offensive gameplan to attack the question marks on Duke's defense. While the Blue Devils have taken care of the ball on offense thus far this season, they have failed to come up with takeaways defensively. To pull off the upset on the road, Kansas has to win the turnover battle and limit opportunities for the Duke playmakers. In what may turn into a Big 12-style shootout, Duke has the more experienced quarterback and the more dynamic offense. Expect the Blue Devils to come out hungry after an inconsistent effort at Troy and put up points quickly. Kansas will struggle to match up with the Duke wide receivers, who will again find the end zone Saturday. The Duke defense will finally get on the board in the turnover department and provide some separation in the second half. If the Jayhawks dare to kick to Edwards or Crowder, expect one of them to break a big return to swing momentum for the Blue Devils. 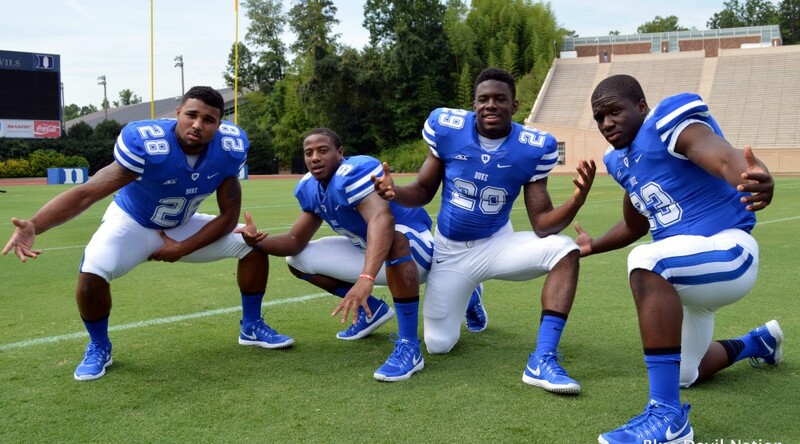 Another solid game from the Duke running back stable will help to seal the victory. These two programs appear headed in different directions, with the Blue Devils looking to defend their ACC Coastal Division crown and the Jayhawks searching for wins on their schedule. 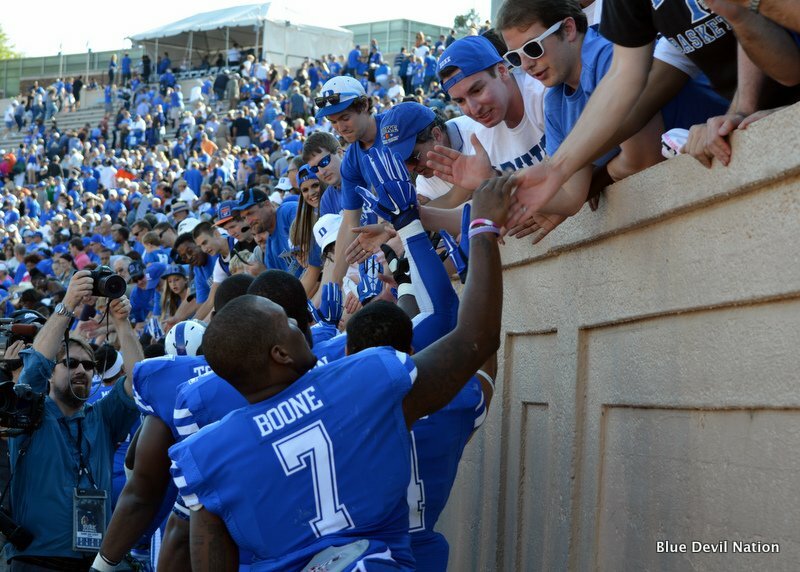 Boone and company will again light up the scoreboard in Wallace Wade Stadium. More free french fries! Behind 4 TDs from senior QB Anthony Boone, the Blue Devils rolled to an easy 52-13 victory over Elon in their 2014 season opener. Re-live the top plays of the night with our highlights, courtesy of Endzone Elite. 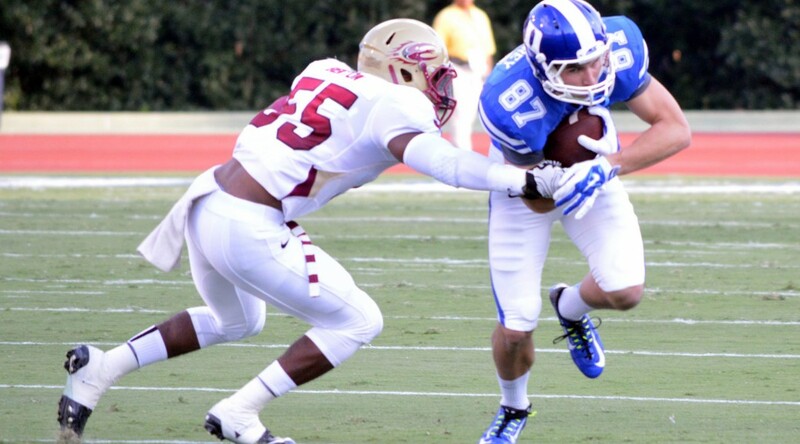 The 2014 football season kicks off with Elon at Duke this Saturday evening. Duke and Elon last faced each other on September 4, 2010 in a game Duke won 41-27 at Wallace Wade Stadium, in the season opener for both teams. Including the 2010 loss to Duke, Elon has lost four season opening games in a row: 45-14 to Vanderbilt in 2011, 62-0 to North Carolina in 2012, and 70-0 to Georgia Tech in 2013. Under Head Coach David Cutcliffe, Duke is 4-2 in season opening games with both losses coming against Richmond. The four wins were over James Madison 31-7 in 2008, Elon in 2010, Florida International 46-26 in 2012 and NCCU 45-0 in 2013. The Blue Devils can win by controlling the line of scrimmage, dictating the tempo of the game and executing a balanced game plan on both offense and defense. Line of scrimmage - games are won or lost in the trenches so Duke will exploit their size and talent advantage to knock the Phoenix back on their heels and keep them there. By dominating the line of scrimmage, Duke will pummel Elon with the running game while being opportunistic with the pass. On defense, Duke will look to shutdown the Elon running game and force the Phoenix into must pass situations. Tempo of game - playing fast to minimalize substitution opportunities provides an advantage to the deeper, more talented Blue Devils squad. Duke will substitute freely on dead ball situations and between possessions to ensure the Phoenix are always facing a fresh running back and set of receivers. By utilizing a trio of running backs and possibly a fourth, Duke's running game will wear down the Phoenix defense as the game progresses. Offensive Coordinator Scottie Montgomery will call an aggressive game, so do not be surprised when Duke unveils a wrinkle or two. Balanced game plan - mixing things up will keep Elon off balance and guessing. On offense, as stated above, Duke will feed Elon a steady diet of the running game, to both wear down their defense and set up quality passing situations. Being balanced is equally important on defense so look for Defensive Coordinator Jim Knowles to utilize the blitz as well as drop an extra defender into coverage. With the defensive line controlling the line of scrimmage, Coach Knowles will have flexibility to utilize multiple techniques with the back seven defenders. The wheels will have to completely come off for Duke to lose. Overconfidence and a total failure to value the football are pitfalls the Blue Devils must avoid. If Duke takes the field with a lackadaisical attitude and commits turnovers in bunches, Elon has the experience necessary to take advantage and capitalize on the miscues. Redshirt senior quarterback Mike Quinn is in charge of an offense that returns its leading rusher, B.J. Bennett, plus a couple of experienced receivers in Andre Davis and Kierre Brown. Quinn set a Southern Conference record in 2013 by throwing 210 consecutive pass attempts without an interception. On the year, he threw for 2,618 yards with 17 touchdowns and nine interceptions. Bennett rushed for 464 yards on 123 attempts and will split time at running back with Tracey Coppedge who led the Phoenix in yards per rush at 4.8 with 90 attempts. Davis recorded 460 yards receiving while Brown logged 448 yards. Senior running back Karl Bostick, who is out with a broken leg, rushed for 443 yards in 2013. The Blue Devils are looking to prove 10-4 in 2013 was not a fluke so they will be primed to start 2014 off in dominant fashion. Team Captains Anthony Boone, Laken Tomlinson, Jamison Crowder, Jeremy Cash and Kelby Brown will ensure the team is ready to go. The 2014 Blue Devils are a team with lofty goals and a committment to achieving those goals so they will take the field this coming Saturday with a steel focus to win. With Head Coach David Cutcliffe, 2013 National Coach of the Year, at the helm, the chances of Duke taking the field less than 100 percent prepared and focused are slim to none. Duke is too talented, too deep, too strong and too fast for Elon. This is a game that should be decided by halftime.